Economic growth is expected to pick up in 2017, but uncertainty about the new US administration (potential protectionist trade policies) casts a shadow. 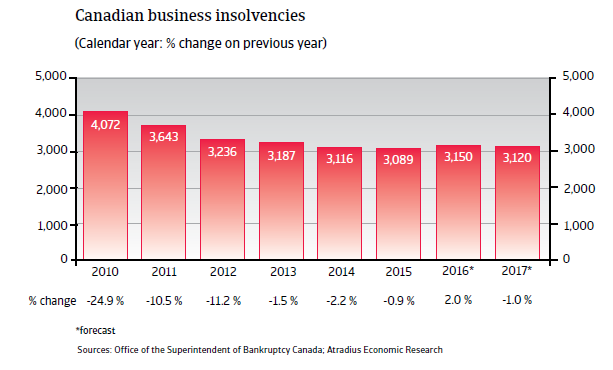 After double-digit year-on-year decreases between 2010 and 2012, the pace of insolvency decline slowed down in 2013-2015. 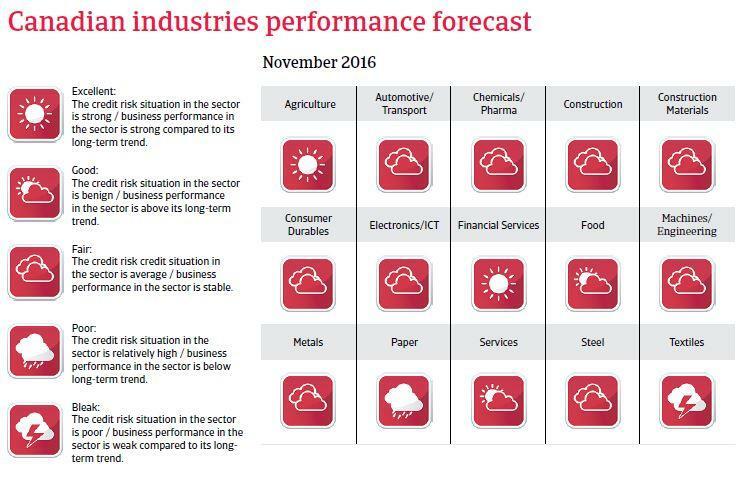 Due to the more difficult economic environment and low commodity prices (see explanation below), it is expected that business insolvencies will increase in 2016, by 4% to about 3,200 cases, followed by a modest decrease of 1% in 2017. The Canadian economy saw robust growth between 2010 and 2014, mainly due to increased global demand for commodities, especially oil. However, as the world´s fifth largest oil producer, Canada has been affected by the decrease in oil prices since mid-2014, suffering a major decrease in investment. Economic growth slowed down to 1.1% in 2015, and in 2016 a similar growth rate of around 1.2% is expected. The slowdown is mainly a result of contractions in manufacturing, mining, quarrying, oil and gas extraction and wholesale trade, while private consumption continued to contribute positively to GDP. 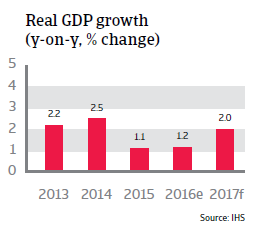 That said, GDP growth is expected to gain momentum at the end of 2016, and in 2017 it is forecast to rebound (up 2.0%), as investments, industrial production, and non-energy exports pick up and fiscal spending (especially on infrastructure) increases. However, uncertainty has increased after the outcome of the November 2016 US presidential election. Any moves by the next US administration under president Donald Trump towards more protectionist trade policies and/or renegotiating the North American Free Trade (NAFTA) agreement would have a potential negative impact on the Canadian economy in the future. After growing 2.6% in 2014, private consumption growth slowed down to 1.9% in 2015, but is expected to rebound slightly in 2016 and 2017. Household debt expanded in recent years, with most consumer borrowing going into buying homes, as property values have gone up and interest rates are low. However, it is estimated that housing is currently overvalued, and household indebtedness has increased to more than 150% of disposable income. This could pose a risk to the economy, especially if interest rates and unemployment were to increase in the future. Any potential economic downturn could turn the consumer debt issue into a real problem. That said, the unemployment rate is expected to remain stable for the time being, at around 6.9% in 2016 and 2017, and the Central Bank has maintained the overnight lending rate at 0.5% since mid-2015. The lowering of the interest rate twice in 2015 was seen as a move by the Canadian Central Bank to boost investments and to make Canadian exports even cheaper. However, the weaker exchange rate and lower interest rate have not led to a real surge of exports of manufactured goods to the US, which accounts for more than 75% of Canadian exports. 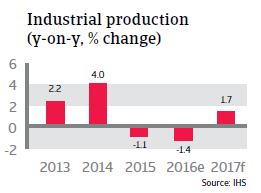 Industrial production contracted in 2015 and 2016. The potential of manufacturing to compensate for deterioration in the energy sector is limited, as manufacturing contribution to GDP has steadily decreased in recent years. At the same time, the Canadian manufacturing sector has lost international competitiveness, as currencies of other countries exporting to the US have also depreciated against the USD. Additionally, Canadian wages are high by international comparison. The growth in exports of goods and non-factor services is expected to improve to 1.7% in 2017, on the back of a weaker Canadian dollar (CAD) and subdued growth of 0.5% in 2016. The current account deficit is expected to decrease to 3.0% of GDP in 2016 and 1.7% of GDP in 2017). 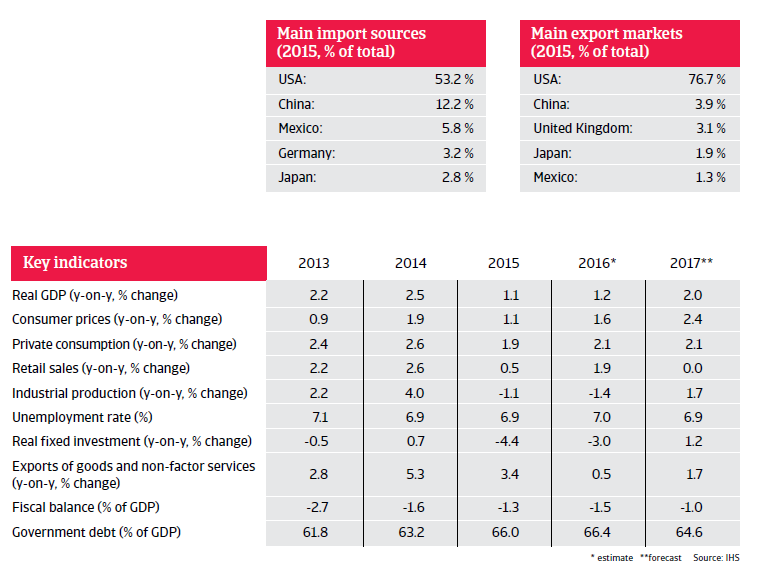 However, any future trade frictions with the US could actually dampen Canada´s export performance in the future. Energy firms, which account for about 30% of capital spending, sharply reduced investment in 2015 and 2016, by more than 50%. At the same time, investment in the manufacturing sector remained subdued. 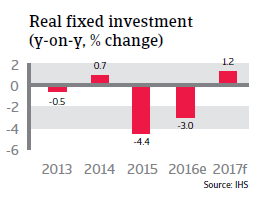 Real fixed investment in Canada decreased 4.4.% in 2015, followed by an expected 3.0% decline in 2016 and a modest rebound of 1.2% in 2017. 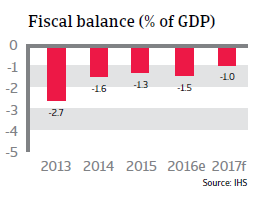 Canada´s budget deficit has increased in 2016, as the government under Prime Minister Justin Trudeau decided to increase fiscal spending in order to stem decreasing growth rates. Government debt is relatively low compared to the US and most Western European countries, helped by the fact that Canada did not suffer a major downturn after the 2008 financial crisis.